and I make large batches of coffee in my drip coffee maker. In all cases the coffee grind should be different sizes. A few days back I posted my thoughts on the best manual coffee grinders for sale but today I wanted to focus on just coffee grinders for french press – manual french press grinders that is. Considering the fact that I work from home and don’t have morning time constraints that some others have changing grind settings between coarse and fine is not that big of a deal for me. I can easily take the few extra minutes to change the grind size from medium-fine to coarse whenever I want but what I failed to take into account previously is that it’s a bit harder for an inexpensive hand grinder to produce consistent grind at coarser settings. The fine folk over at Prima Coffee echoed my concerns a while back and found that among the bestselling and most highly touted hand crank coffee grinders, the Skerton and the Mini Mill, the Hario Mini Mill was probably the best manual coffee grinder for french press coffee due to it’s spring loaded support mechanism for the movable burr. Because movable burrs in stepped and fluid burr grinders are prone to – well, movement – coarse settings are frequently going to slip between fine and coarse grind through normal use. The Hario Mini Mill however supports the movable burr with a spring ensuring a more consistent grind size and less dust. Although the Mini Mill may not be the best crank grinder for large amounts of coffee or even for espresso or other fine grinds it is probably far superior to the Hario Skerton for coarse grind coffee. Long story short, assuming you are making a small batch of french press coffee the Hario Mini Mill is going to be your best hand crank choice. It will also pair well with these travel friendly french press travel mugs. For bigger batches of french press coarse ground coffee you can also use the Mini Mill or jump up to the Skerton if grid consistency is not that big of a deal. In the future I’ll have a page on this outlining the best coffee grinders but for the time being you’ll just have to wait and come back again. Drop your email in the box in the sidebar and I’ll keep you in the loop. In all cases french press coffee is almost always going to leave a little sludge in the bottom of your cup so you won’t be stepping down too much for the extra volume. Read this post for my favorite way of cleaning your french press without plugging up your drains. If you have been using French press for quite some time, you will notice that there are three important things to remember to achieve that perfect, beautifully tasting French pressed coffee. These elements are coffee grounds, water temperature and steeping time. Use only coarse ground coffee. The texture of your coffee grounds play an important role in determining the taste of your coffee. Too fine coffee ground will only end up in your cup. Coarse ground coffee is the perfect texture. The filter will also work effectively and prevent coffee grounds from mixing in your cup of coffee. Measure water temperature. Boiling hot water is not good for brewing coffee. Aside from the fact that it is scalding to the skin and can cause accidents, boiling hot water burns your coffee grounds and make your end product bitter. The recommended water temperature for optimum brewing is between 195 degrees Fahrenheit to 205 degrees Fahrenheit. Some users of glass French press warms up the carafe with hot water, then they pour the needed amount of hot water. This maintains the temperature and keep the coffee pleasantly hot. Observe steeping time. The strength and flavor of the coffee lies in the perfect timing. Steeping the coffee grounds allow for the hot water to evenly penetrate all the grounds. This helps in bringing out the flavor of your coffee. But, do not over steep. It will make your coffee bitter for drinking. Recommended steeping times is 3 minutes. Since coffee grounds play a crucial role in brewing coffee using a French press, buying a grinder for home use is a practical investment. There are different types of coffee grinders out there. Let’s take a look at what’s available in the market today. This is considered the cheapest kind of grinder. Your kitchen blender can double as a crude blade coffee grinder. Just like the blade of a blender, this type of coffee grinder slice, tear and smash coffee beans. However, it makes inconsistent grinding. Plus, the high RPM rate can burn the ground coffee. According to expert, if you are using a blade grinder, grind the beans for 20 seconds tops. Nothing beats old-fashioned, manual, hand-driven, burr grinders. It may sound so old school but the rhythmic fashion of hand grinding produce a consistent texture of the ground coffee. You will need a minute to grind coffee beans for a cup of coffee. You may need to pay a few more bucks for it, but it’s worth the investment. Baristas prove that this type of grinder produces consistent coffee grounds that works well for coffee makers used in gourmet coffee shops. The beans fall in between cones and discs, ensuring consistent grind. However, they come at a price and may not be a reasonable purchase for average home users. Hario is a known brand for pour over coffee. They know too well the elements of a great coffee brew. 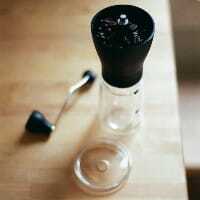 They created this burr grinder to go well with their pour over products. But since pour over also relies on coarse ground coffee, you can never go wrong with this one. It may not be the fastest manual grinder but it’s very easy to use. It is also lightweight and you can bring it with you anywhere. If you plan to use more coffee beans, you may have to use it several times until you achieve the right amount of coffee grounds. Some things just never grows old and this is true for this antique model. It’s as classic as it can be. It reminds you of quiet times in the rural areas as your mom prepares breakfast with a labor of love. It grinds fast, about a minute for two cups of coffee. Plus, you don’t really need to clean or wash it. Because the mechanism ensures that all coffee grounds are collected, no residue is left inside. Why choose a manual grinder? Here are some reasons why getting a manual grinder is helpful. It’s practical. Manual grinders are inexpensive. You don’t need to burn hundreds of dollars just to get a nice manual grinder. And if you own a French press, a manual grinder is your best partner in making the perfect cup. Manual grinders use burr instead of blade. 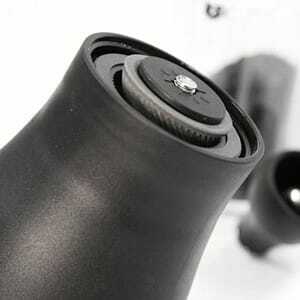 This creates an even grind so you can have a consistent texture for your coffee ground. It’s easy to use. With a little bit of manpower, you can simply turn the handle and grind along. Even if you are out of the house with no electricity, armed with a French press a nice burr grinder and hot water, you can make a cup of coffee to enjoy.